impressions on the ad network. Android has now been the leading OS on Millennial’s platform for the past 11 months. iOS was the second largest smartphone OS on Millennial’s platform with 28% of the impression share. RIM followed with 13% of the share. iOS led the Connected Device OS mix, thanks to the growth in the iPad, which has has been the number one tablet device on Millennial since its debut in April 2010. Touch Screen devices grew 44% year-over-year and led the Device Input Mix in October with 69% of the impression share. In October, Wi-Fi grew 19 percent month-over-month and accounted for 35 percent of the Carrier Mix. Phones ranking, with 13% of the impression share. Samsung grew 7% month-over-month and represented 17% of the Top 15 Manufacturers ranking in October with six phones on the Top 20 Mobile Phones list. Android devices actually represented 14 of the Top 20 Mobile Phones in October, with a combined impression share of 24%. Android represented 50% of the Application Platform Mix on Millennial’s network and Music & Entertainment continued to lead the Android application categories in October, ranked by impressions. There was also a 14% increase month-over-month in Productivity & Tools applications. 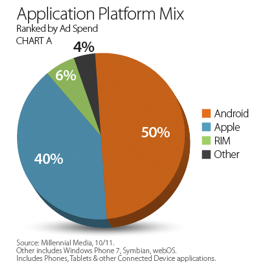 Apple represented 40% of the Application Platform Mix, ranked by ad spend, in October.